Core dimensions of this radiator are approximately 18 1/2" tall and 18 1/2" wide. An internal automatic transmission cooler is built into the radiator. These measurements may vary slightly from the original that it replaces.It will fit the same as and function better than the original. 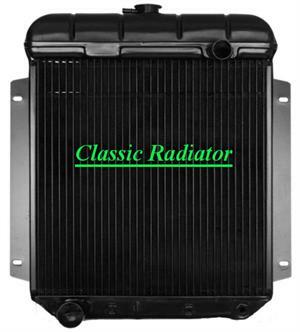 US Radiator copper radiators are made to bolt in exactly as a factory replacement radiator would. They are available in several core designs such as three rows of 1/2" tubes on 9/16", 7/16" or 5/16" centers as well as in two, three or four row versions. All US Radiators can be ordered with an aluminum fan shroud, electric cooling fan and thermostatic fan control. The top tank of the radiator can be polished to show off the vintage brass look. It can be ordered to fit a 6 cyl application. This particular radiator can be ordered in a variety of configurations to suit your cooling needs and your budget. Even the largest radiator cannot cool properly without good airflow. Consider replacing your stock 4 blade fan with a six or seven blade fan for optimum cooling.